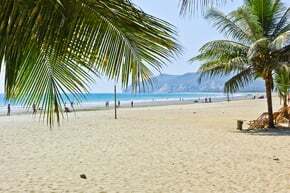 Less developed and lacking the high-rise buildings of some other coastal towns, Puerto López offers a relaxed and inexpensive place to enjoy the beach, savor fresh seafood caught just offshore, and experience Ecuador’s coastal wildlife for the weekend. There are many restaurants along Puerto López’s malecón (esplanade), but Carmita’s is one of the best. Try the delicious langostinos al ajillo (garlic prawns) for around $10. With fresh seafood and long, uncrowded beaches, Puerto López makes for a great weekend getaway. From the new pier, you can now get boat trips to nearby Isla de la Plata. Depending on the season, there is a good chance of seeing humpback whales on the trip (which takes a little over an hour each way). The best months for whales are June through August. Isla de la Plata has a visitors’ center near the beach. From the center, tours go up to the top of the island to see blue-footed boobies, as well as magnificent frigate birds and nesting albatrosses. A day here costs around $30 to $45, depending on the operator, including return trips to the island and access once you arrive. 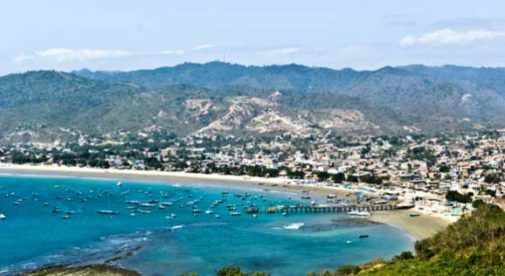 Not far from Puerto López, Playa Los Frailes is a beautiful beach with a mirador (observation tower) at the end. The views from the top are spectacular, with waves crashing on the rock formations below. Nearby is Agua Blanca, an indigenous community whose members act as guides for a roughly two-hour walk through the forest to the sulfur pool. It’s a relaxing spot to take a therapeutic dip—the mud is great for your skin. Don’t worry about getting messy; there are showers and changing rooms nearby. Ayampe is just south of Puerto López. A popular surfing beach, it also attracts many people in the late afternoon who gather to watch the spectacular sunset. I hired a taxi in Puerto López, and the driver waited and enjoyed the sunset while I shot photos. The round trip cost me only $15. On my visits, I’ve always enjoyed staying at Hostería Bella Napoli, up the beach from the town center. The price of a stay is around $35 a night (although this varies with the season).